Seeing the Axtone stage would be dope, but ultimately I'm aiming for SHM, obviously. Do you think we could see them closing (or at least on Sundays) the festival? If they're going to TML, I doubt that they'll announce it before tickets sell out, there's just not enough time left. As for which day in case they are going, it's just pure guessing. I would get the ticket for the Axtone day and then, if they end up going to TML and tickets are non-personal (which I don't know, but doubt it given the prices), you could try find someone on internet to swap it out for whichever day SMH plays. But again, it's a risk. They said in the press conference "we'll start in Stockholm". They sold the Stockholm shows as their tour start shows. If they appear on any stage before May 2nd, ticket holders are going to be pissed, and with good reason. So no, I don't think they're going to play on Miami. They could go as a solo act, though. Axwell closing Ultra, that would be cool. steve closing friday, seb closing saturday and ax closing sunday the whole festival. 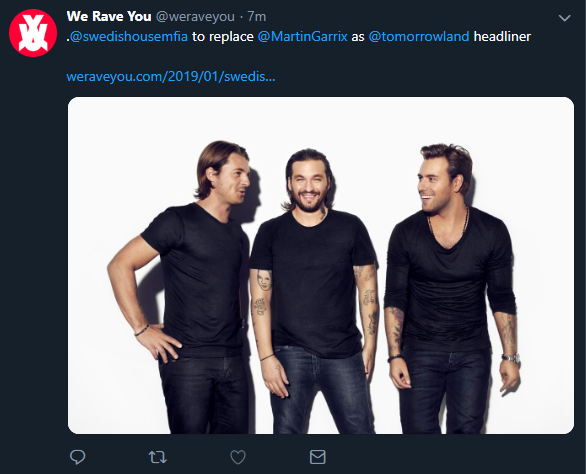 I'll save you the click: They wrote a full article making up a "war" between SHM and Garrix because Garrix is not playing TML mainstage this year and that "surely" means that SHM is closing on Sunday. Who wakes up on the morning and says "yeah, today I'm going to make an article on a kinda-big EDM blog with the most clickbait title ever based on absolutely NOTHING"? Honestly, it’s the exact same assumption I had when I saw his tweet. All other mainstage headliners are set up for Friday and Saturday. There’s a huge chance for SHM to be closing both weekends.